Having given some thought over the years to the way people think and interact in meetings, I have pulled together this simple model of interactive collaboration, or What is the thinking behind the behaviours that we observe in our meetings? The model is an inclusive one with a place for all interactive styles depending upon context, however in this instance I present it as a judgmental one, suggesting that the top right quadrant is where we should be if we have some serious thinking and interaction to do. The two key criteria I have included on the axis are FOCUS and PERSPECTIVES. Without either there’s probably not much point convening to meet. By FOCUS I refer to: What does the assembled group want to get out of the meeting? What is the intended outcome? Too often we venture into meetings with very different expectations. By PERSPECTIVES I refer to the diversity of views that are carried by the meeting attendees. It is important that we are able to hear and incorporate these views where appropriate. Too often we hear a view that is contrary to our own and we shut-down our thinking because we are of course – Right! It is important to be able to incorporate diverse perspectives because it is through diverse approaches that we are more likely to gain traction on difficult issues. Starting in the bottom left quadrant we have adversarial thinking. Here we seek to have our own views prevail over others. It this quadrant is is usually about winning. Unfortunately most of us don’t take too kindly to having our views contradicted and opposing views expressed. When this happens we waste time and brain-power in rambling discussion and argument, which in many instances is counter-productive when you have a specific outcome you must achieve. Those who are more senior or the best at argument and debate will usually prevail in this quadrant, irrespective of whether or not their perspective is the best one. In this area we have a minimal number of perspectives tolerated and little agreement on how to achieve our focus. For a great example of adversarial thinking watch our Parliament in action. Top left we have disparate thinking. Here the approaches are less adversarial but remain scattered and unfocused. We have many views here but not all are overly productive and add little value to the meeting. 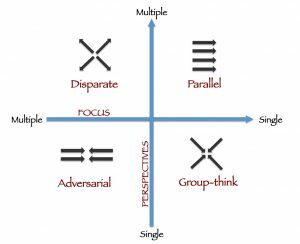 In this quadrant there is often the diversity required but insufficient focus to incorporate its value. In group-think mode people will just tend to agree with the prevailing view for fear of being seen as different. Often, in a hierarchical organisation group-think happens because expressing a view that is different to more senior views can be a career limiting move. With Group-think there tends to be little exploration of the possible outcomes and even less exploration of possible means of achieving the outcomes. 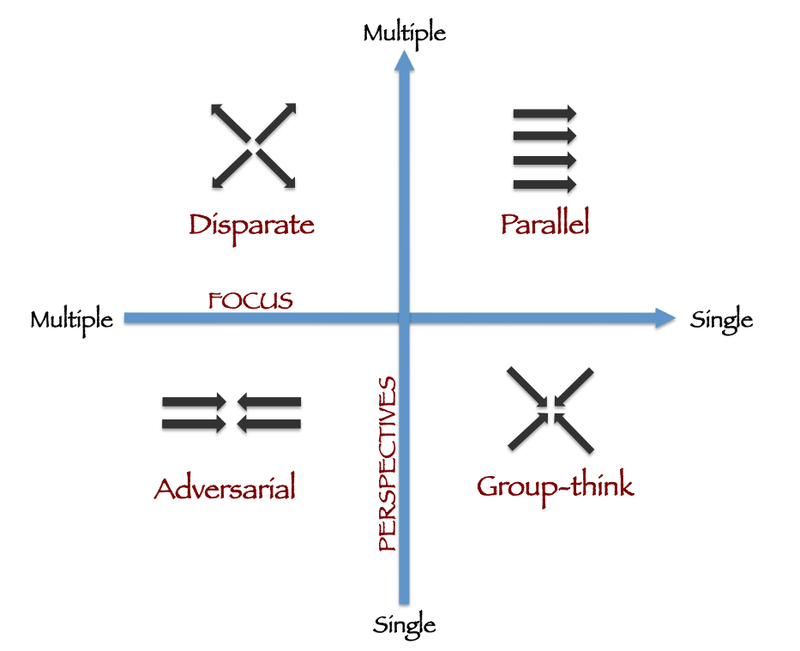 The top right quadrant is where parallel thinking occurs. Parallel thinking is a term coined by Edward de Bono and it finds its best expression in the application of the Six Thinking Hats methods. Here the focus of the session is clear, people know why they are in the room and what is expected of them. Here also there is a very deliberate incorporation of the multiple perspectives that are around the table. This is achieved by the group examining the topic at hand from the same thinking perspective at the same time. Diverse perspectives are welcomed but do not bring people into conflict because they are expected and welcomed! With parallel thinking we have a single Focus and multiple perspectives incorporated. The inclusion of the multiple perspectives allows a full subject matter exploration – something we rarely get when time is short and argument prevails. An important side benefit of getting your people thinking in parallel is also that the meetings will dramatically reduce in length, a valuable outcome in itself when work demands increase and our time-poverty increases with them. Most meetings will not stay within the one quadrant throughout, often they will tend to move between quadrants. We shouldn’t seek to eliminate this movement entirely, rather we must get participants to maximise their time in the parallel space and minimise their time in the less productive thinking spaces. We do this by using a range of techniques that assist meeting participants to move from Adversarial, Disparate and Group-think into Parallel thinking. When such techniques are incorporated, interactions becomes more focused, inclusive and outcome oriented. If you’d like your meetings to be more oriented toward outcomes and business results, Think Quick can help you – Just give us a call.